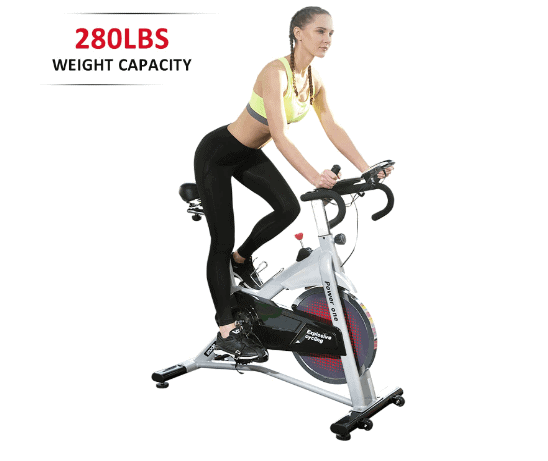 The SNODE Indoor Cycling Spin Bike Trainer Model 8729 also known as the Power One Cycling Bike is a 2019 release and it has managed to catch our attention. This is a brand that is hardly a household name but then don’t ignore the underdogs because they can be consequential. In other words, being a spin bike whose brand is not known might turn out to be one of the best spin bikes after all. This bike has the features of a good spin bike after taking a closer look at it. It is a front belt driven bike with a sturdy steel frame. It has got an easy step thru design that allows you or anyone to mount and dismount without hassle. Due to the inseam heights (min. 32 inches-max. 40’’) taller individuals will be accommodated conveniently. Once the measurement of your top inner thigh to the ankle falls within 32 inches to 40 inches then you are good to go. It also supports 280 pounds/127 kg maximum user weight capacity. The bike is non-foldable but it is compact, portable and customizable. The 40 pounds/18 kg flywheel provides momentum and supports the friction resistance system for challenging workout experience. In case you are looking for an alternative, it has some similarities with the YOSUDA Indoor Cycling Bike L-001A. While the latter (YOSUDA) is cheaper, the SNODE Indoor Cycling Spin Bike Trainer Model 8729 has a heart rate function and the latter doesn’t; its handlebar has more grips and the flywheel is heavier than the latter. Other than those they are pretty much the same. Click right here to have a peek at the discounted price of the SNODE Indoor Cycling Spin Bike Trainer Model 8729 on Amazon. The frame of the SNODE Indoor Cycling Spin Bike Trainer Model 8729 is built out of solid steel and coated with anti-corrosive paint conserves its quality, while the seat and the handlebar posts are chromed. It is sturdy enough to support up to 280 pounds/127 kg maximum user weight capacity. The base framework establishes stability that withstands any sort of intense or vigorous workouts. The bike won’t tilt or rock during an exercise because it features sturdy steel front and rear stabilizer bars that have adjustable leveler underneath for leveling up the bike on a surface that is not even. Moreover, the bike weighs about 90.4 pounds/41 kg which advantageously boosts the overall stability. Meanwhile, the front base is integrated with transport wheels that make it easy for the user to roll away the bike to and from the workout and storage areas despite its weight. It is compact because its overall assembled dimensions are 41 inches long by 21 inches wide by 46 inches tall. Differently put, the workout perimeter for the bike would be 3’4’’ long by 1’75’’ wide and a ceiling height of at least 7’ high. If it is going to be used in a confined area then an additional extra clearance of at least 1 to 2 feet at the rear and on each side of the bike will be necessary for safety and convenience reasons. The seat and the handlebar adjustability allow you to customize the bike for comfortable riding experience. The belt drive transmission and the friction resistance system ensure that you are able to engage in quiet, smooth and productive cardiovascular workouts that burn tons of calories and improve the overall physical well being. The seat on the SNODE Indoor Cycling Spin Bike Trainer Model 8729 is comfortable. It is well cushioned and made of breathable sponge and covered with artificial leather. It has good heat dissipation performance and also integrated with two springs underneath which serve as shock absorbers. You will feel comfortable even in long-term riding. However, if for any reason you wish to swap it for another saddle you can because the connection mechanism is standard. You can adjust the seat 4-ways; that is horizontally (fore/aft) and vertically (upward/downward). The seat supports inseam height of min. 32 inches-max 40 inches. In other words, users that have inseam height between 32-40 inches will be able to use the bike conveniently and comfortably. Therefore, you may want to measure your inseam to be sure if you are not. The handlebar is also adjustable but in 2-ways. It could be adjusted vertically (upward/downward) only. However, it complements the bike’s overall adjustability and allows users to customize to a certain extent. Both the seat and the handlebar adjustment is very easy to do and won’t take a minute to get all the right settings. The handlebar also features a multi-grip design with three distinct grips for different postures and ride. These grips are the ordinary grip, the climbing position grip, and the racing grip. You can engage in challenging and sprinting exercises with the supported grips. You can train longer, comfortably and safely because the handlebar is coated with soft rubber foam material. Moreover, the EKG sensors are embedded in the handlebar so that your heart rate can be transmitted to the monitor whenever they are held or gripped during a workout. This allows you to keep an eye on your pulse rate so that you can always maintain your target heart rate zone. The pedals are attached to chromed crank-arms and they feature toe cages with adjustable safety straps that keep the feet in place and secure during normal and intense workouts. The SNODE Indoor Cycling Spin Bike Trainer Model 8729 is equipped with a belt drive system that provides smooth and quiet transmission. The belt drive system is preferred by some users because of its smooth and quiet operation and it doesn’t require periodic lubrication or perhaps adjustment as the chain drive does. You can exercise without the apprehension that the family or the neighbors might complain of disturbances. You can also enjoy watching your favorite TV show or listen to good music as you exercise without having to turn the volume so high. The drive consists of a durable belt, a solid 3-piece crankset, chromed crank-arms, and of course, the heavy perimeter weighted 40 pounds/18 kg flywheel. Together, these elements provide you an outstanding and effective drive. Train as you wish, sit or stand and ride to mimic hill climbing, the pedals support all of those. You might as well pedal in reverse to diversify your workout and also tone more muscle groups. That said, the pedals and the flywheel are fixed which means you will not be able to coast as one could on a road bike. The SNODE Indoor Cycling Spin Bike Trainer Model 8729 is integrated with a friction resistance system that consists of a wool felt pad, the 40 pounds/18 kg flywheel, and the tension knob. It called a friction resistance system because unlike the magnetic resistance system the wool felt pad comes in contact with the top edge of the chromed flywheel in order to generate resistance and this act is called ‘friction’. The good news is that the resistance can be adjusted to infinite levels that are suitable for a beginner, intermediary, and an advanced professional athlete. It provides easy to extremely difficult workouts that could have your heart rate all riled up and burn tons of calories. The tension knob is used to increase and decrease the resistance strength. Turn it clockwise to increase and anticlockwise to reduce it. The tension knob also doubles as the emergency brake. Remember that the flywheel and the pedals are fixed which means they spin simultaneously. 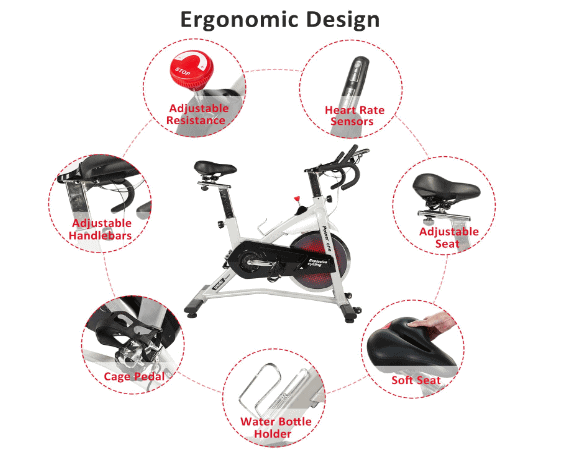 Therefore, you will need to apply the emergency brake by pushing the tension knob down every time you wish to stop pedaling in order to safely halt workout activity. On the other hand, the downside is that you will not be able to determine your strength and endurance progress because there are no predefined resistance levels that would allow you to compare the highest resistance levels used in different workout sessions. However, you can always feel the improvement and not necessarily by numbers. The wool felt pad wears out over time and would need a replacement but this often takes time. The Power One Cycling Bike comes with a console that is rather basic but features a monitor that helps you to stay focused and motivated. The console also has a single MODE button for navigation and very easy to use. The monitor displays real-time workout data such as time, speed, distance, calories burned, odometer, and pulse when the sensors are held during exercise. It is well positioned for good readability; however, the visibility could diminish if viewed in an environment that is not well-lit because the monitor is not backlit. The monitor also has a SCAN function that rotationally displays workout metrics one at a time after a few seconds. But you can also set a certain workout data to display constantly without skipping to another. Neither the bike nor the console needs a power outlet to be functional but instead, the monitor is powered by batteries. The SNODE Indoor Cycling Spin Bike Trainer Model 8729 has a tablet holder and a water bottle holder. The two are strategically designated for easy use. The water bottle holder is on the mainframe within reach for easy access. This allows you to keep water handy in order to stay hydrated throughout the entire workout session. The tablet holder is also positioned in a way that a device placed on it doesn’t block the view of the monitor display. Therefore, you can enjoy watching a movie via your smartphone or tablet while you are still able to view your workout metrics. It is also important to note that the tablet holder secures any type of smartphone or tablet adequately. 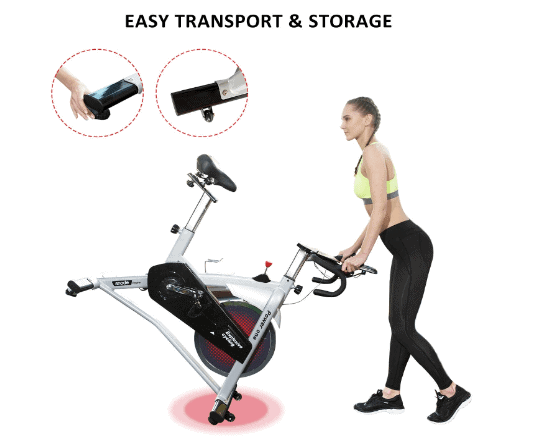 The storage of the SNODE Indoor Cycling Spin Bike Trainer Model 8729 is easy because it is not large and has transport wheels that allow you to roll it away without hassle. It doesn’t take up much space because 3’4’’ long by 1’75’’ wide area is just enough for the storage. There are instances where the bike could be stored such as under the staircase or next to a wall in the room. The SNODE Indoor Cycling Spin Bike Trainer Model 8729 is shipped in a box that weighs 99 pounds/45 kg. Amazon provides free shipping for this product and delivers in a couple of days after an order has been placed. Just like any average indoor spin bike, the SNODE Indoor Cycling Spin Bike Trainer Model 8729 is delivered partially assembled. The major components such as the drive and the resistance systems are already attached to the frame. You are expected to attach the front and the rear stabilizer bars, the seat and the handlebar posts, the pedals, the seat, the handlebar and the console to the main core. The tools required for the assembly and an instruction manual are included in the package. It will take less than an hour to completely assemble the bike. No serious maintenance is needed for this bike. Basically, you have to always examine it before use for any loose or broken part so that an accident and further damage to the bike can be averted. Clean before and after use. The SNODE Indoor Cycling Spin Bike Trainer Model 8729 is like any other good and average spin bike. It doesn’t have any unique feature but has the right features to make your workout enjoyable and productive.